Year End Mania is the Key’s survey of the things below the surface that made 2013 awesome. 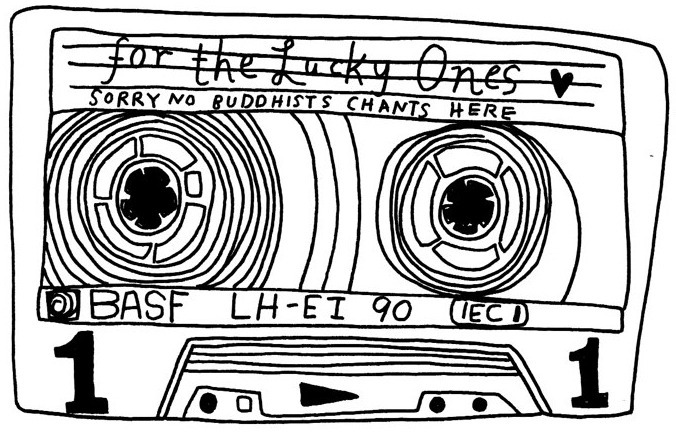 In this installment, contributor Laura Jane Brubaker shares some essential mixtape tracks. 2k13 has come and [almost] gone, and if there’s one thing I can say I really nailed this year it would be the art of the mixtape. “But LJ,” you may say, “your 2k13 proved overwhelmingly to be a laundry list of failed romantic endeavors.” And right you may be, but rest assured that not a smidge of that was the fault of my meticulously crafted, amatoriously motivated mixtapes – of which there were two For Tom’s (different Toms), one for a crush who promptly came out as gay, and a Mixtape for Horoscope Fulfillment which, needless to say, didn’t fulfill squat. But there were also plenty of platonically-minded mixes and I still have friends, so ha. Through all this I came up with a few good rules for crafting an excellent mixtape. First: don’t awkward yourself out of a good song. 89% of music alludes to love in some way so if you’re trying to avoid anything that mentions feelings because you’re wicked anxious about creeping someone out, you’re gonna have a crap mixtape. Second: be original, but don’t be afraid to recycle yourself. I got really good at trolling through my expansive Google Play library, which has served as theft/water-proof repository for all my musical holdings since 2010 and is a treasure trove of songs I don’t remember downloading or even hearing ever. New songs make for more interesting listening, I think, and some of my favorite musical discoveries have come while digging for mix material. Keep in mind, it’s also cool to use the same song a bunch if you think it works and you’re making lots of mixtapes anyway for some reason. Heck, that’s how I came up with this list. Finally: if you can pull it off, use a cassette. It’s old school, it’s unique, and while it may prove to be tricky for the recipient to play, the effort that goes in to a legitimate mixtape (versus a CD) makes the whole thing a lot more meaningful for everybody. Here are the tunes I hold in the highest esteem for mix-craft. You can thank me when you’re married. This one comes out of the box first because, despite what I already said, using a song with the words “true love” in the title may be TOO bold a move depending on your situation. Nevertheless, Ben’s song is a lush and spacious landscape of a track, perhaps abstract enough in its construction to help you get away with the directness of the title. But if that’s what you’re going for then hey, don’t let me stop you. There are times when we all feel a little confused about where we stand in any proto-relationship. This one is for the times when you need a song that literally asks “who am I to you” four times. In concert, Kishi Bashi described this as a love song, though, and it’s certainly beautiful enough to be more versatile. Brendan Glasson of Vio/Miré has been making some of my favorite music for years. Appleseeds is a curious little piece, all humming and little sounds encircling a narrative of a beloved’s gentle efforts to become close. Appleseeds is dearly earnest and better capable of saying the sorts of things you want to say than you are. 4) “Tahiti” by magic magic. I have long held that this song is a super supreme pick for any mixtape. “I would kill to see your face under the same blue sky as me today. I would kill to feel the patchwork that makes up your entire being and your soul,” runs the chorus. Shoot, I want someone to say that to me. The whole killing thing aside, there’s just something about this song that grabs me every time. Maybe you’ll hear it, too. Sometimes you just want to come out and say it. “But honesty is hard!” you tell me. Of course it is! So let the music do the talking! That’s what I’ve been trying to help you with this whole time, you dingus! The simple, sample-based elegance of this song makes a point without driving it home too hard, and that’s precisely what a good mix should do. I was going to use this song in a mix for my now-boyfriend but he jumped the gun and checked it out when it came up in my Spotify feed (thanks, social media) so I missed out on the one time this might have worked for me. But hey, it sort of did. I wish you at least that much success.